Dan Saladino travels from Brixham to Tokyo in search of bluefin tuna. There have been more sightings of the endangered fish in British waters, but does that mean we can eat it? Dan Saladino travels from Brixham to Tokyo in search of Bluefin tuna. In recent months there have been more sightings of the endangered fish in British waters but does that mean we can eat them? The Bluefin is the rarest, most valuable and at risk of the seven tuna species found around the world. Found in three main stocks around the world, in the Pacific, Southern and Atlantic Oceans, some populations of the fish have declined by more than 97 per cent. The vast majority of these large, fast and magnificent predators end up being auctioned in Japan where they are prized by sushi chefs. 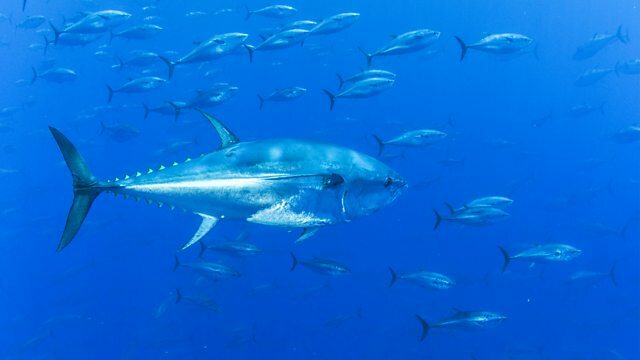 Dan looks at the past, present and possible future of our relationship with the Bluefin Tuna, hearing how its numbers fell into decline in the latter half of the twentieth century and why there are hopes for its recovery in years to come. He travels to Tokyo to witness the tuna auctions at which some single fish have fetched prices as high as £2.5 million and finds out what led to its appeal in Asia. Chef Mitch Tonks describes his own experience of Bluefin, both as a fish he's watched hunting along the UK's southern coast and as a food he's eaten in Japanese sushi bars. Professor or Marine Conservation Callum Roberts explains how we should react to the increased sightings in the Atlantic, and a police investigator describes how criminal networks are also targeting the Bluefin trade. For the fascinating tale of how Bluefin tuna came to be so important in Japanese food culture Dan talks to Trevor Corson, author of The Story of Sushi: An Unlikely Saga of Raw Fish and Rice. Why are sharks so hard to like?